Not long after, the river narrowed, and we were peering into the dense foliage. We saw many blackbirds flying overhead. Vics who was sitting at the back of the boat with the boat driver was eying the dense foliage with his binocular. Vics called out in excited voice, "Oh look at that blackbirds guys!" Suddenly he saw movement. His voice got more excited as if seeing the animals for the first time,"Oh monkeys, Oh my god, they're jumping...Oh my god, guys, guys look at iguana... right in-front of us. Oh my God this is not National Geographic, this is the Discovery Channel." He asked, "Can you see? Can you see?" The iguana was hard to spot because it had the same color as the branch it was clinging to. As we got deeper into the tributary, the river narrowed to an almost like creek, pampas grass brushing the boat from one side, fallen branches and overhanging branches reflected on the water. Carlito readied his machete to chop the overhanging branches off that almost blocked our way. Then it happened! With a quick swoop of the machete, the branches fell on the water. The beautiful scenery of overhanging branches and the overgrowth reflected on the water that created different patterns and the vigorous bird life competed for my attention. Vics called out in an excited voice and motioned the driver to slow as he tried to spot whatever it was that caught his eye. Vics was quick to name the birds - oriole, roadside hawk, red and white spine tail, and bird with yellow belly, tropical key bird, large bill tern, plum-throated woodpecker, crimson-crested woodpecker, laughing falcon, bigheaded falcon, blackbirds, and yellow white egrets, collared aracari, cormorant, harpy eagle, red-throated hummingbirds, and cream-collared woodpecker (a rare species). Then he would open his book of birds to show us what we just saw. At the sight of a luminescent blue macaw perched on the loftiest tree, Vics rose from the back of the boat, called out in overly excited manner, “Do you see it? Oh there's two?” “This is unbelievable guys!" There were gasps of admiration as we watched the colorful birds flew from the loftiest branch to a lower branch and exposed their exuberant color. If only I could get a little closer, I thought, trying to ready my phone camera, careful not to drop it on the water. I raised it to capture the moment, but even as I touched the camera icon I knew I had missed it. The blue macaws flew through the air in swift flight for one so pretty and in vibrant color. And then they were gone! Vics asked the anxious photographers, "Did you get it guys? Did you get it?" It was not after a wider tributary and more black water and an hour later that Vics brought us to the highlight of our excursion - fishing. Vics motioned the driver to slow down and bring the boat to stop beneath a big tree. Carlito chopped the overhanging branches off so that the boat could pass through and moor to a tree. Each one got a twig fishing rod. Vics said that the fish flourished in the area because they fed on the fruits that fell from the trees. Vics told us to tap the water with our poles in order to create the illusion of a fruit falling on the water. Under the big tree and on the quiet pool we cast our poles. There were many fish in the water, but minutes after casting our poles, nobody caught anything. “That was practice,” said Vics. We moved to a different location. Then a pattern was set: Vics would motion the boat driver to stop, Carlito would chop a few branches off, the boat kept in silence and moored to a tree, and nobody caught any fish. The tiny silvery fish that Todd and Barb caught were immediately placed back into the water. I couldn’t help but thinking that perhaps fishing was an activity added for us to experience the water life within the natural reserve, but not really serious on taking the fish from the protected natural reserve area. I did not see any buckets where we could place our catch just in case. "Nobody should be fishing around here anyway," I thought. After the uneventful fishing adventure, our boat stopped to smooth black water pool so we could eat our breakfast. Ahead of us, I saw large ripples followed by pinkish head emerging from the swirling water. Suddenly, just feet away from our boat, the pink dolphins cavorted and played. Their elusive movements, their strange humped shape and peculiar color, gave them a mythical and ethereal feel. As if I were standing in Disney animated film, with a childish grin on my face, I felt a pure and unadulterated joy watching the dolphins emerged and leaped from the water. After breakfast, we found ourselves back alongside the riverbank to see half a dozen spider monkeys, capuchin monkeys and red-howler monkeys leaping from one tree to the next, and more birds. 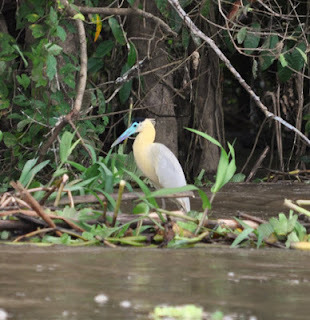 At the sight of a couple of macaws from the loftiest branch or a hawk perched high on an acacia tree or a crimson-crested woodpecker perched on a twig or egrets prancing on the water hyacinth, Vics showed the same excited reaction as if seeing them for the first time. Of course, we were always ready to snap away. John who had a big camera tried to position himself on top of the middle of the boat by lying on his stomach to get the best photo. Our small boat zipped along the river for our return to the Turmalina. Before reaching the Turmalina, our boat stopped at a house built on stilt with a good size platform. A lone skinny dog hunched on the edge of the platform watching us. Women stood behind the rows of hand-crafted jewelry (beads strung together) laid out on a table and children holding simple carvings offering them up to us as we arrived. Vic told us that we could purchase those items laid out on the table and platform, but to remain on the boat. He then got out of the boat to go to what appeared to be a Rainforest Ranger station or a toll booth. He came back with a logbook where we wrote our name, age and profession. I saw Vics pulled out some tickets from his pocket, perhaps to pay for our use and amusement of the protected natural reserve that day. We visited a village later that day. 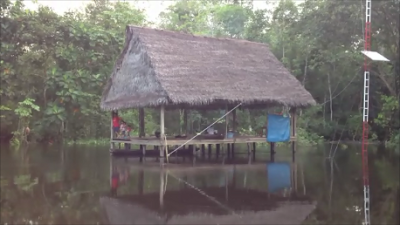 The village consisted of about 8 wooden huts with palm-frond roofs built on stilts above the water, a school, a concrete building (built by a semi-private bio organization used for studying and processing cooking oil), and more wooden huts surrounding the square. We first visited a house that had a tiny store – “the 7-11 of the village”, according to Vics. Then he introduced us to the owner and asked her if we could have a glimpse of how she lives. The people from the village have warmth and welcoming spirit. No sense of annoyance while we imposed on their daily lives. There was also a store within the next house. 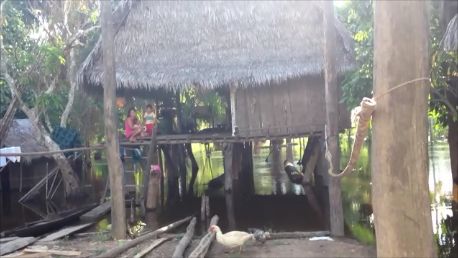 We saw a woman on a canoe, below her house, cleaning fish. Vics introduced us to a woman who toured us around her house to show us the typical hut construction materials. The construction made from materials gathered around the jungle last for ages, but the house is away from electricity and running water. Then a woman clutching a child was waiting by her doorway. We asked Vics if it was okay to take pictures. Vics said, "Yes, it's an Amazonian picture. Don't take one, take two." Vics approached the woman and asked about her medicinal concoction that was supposed to be good for all kinds of ailments. She offered them for us to drink. Instead of drinking from the same cup used by the whole village, I politely asked the woman in Spanish if I can just apply the concoction onto the back of my hand. I handed her a few soles. “Oh you speak Spanish. I heard you talked to the woman in Spanish,” Todd said later. I did not realize I could speak Spanish. Apparently, I could. We passed a house with mounds of aguaje fruits ready to be placed in sacks and sold in the city for S/10.00 (soles) per sack. A dozen boys were playing in the square, kicking footballs or chasing skinny dogs. We wondered where the girls were. A boy approached us and pointed to sloths perched on a tree. His name was Jefferson. He took over Vics' itinerary by guiding us around the village and showing us his school. Our village tour ended at the community hut on the square, where a few young and adult women stood behind the rows of handcrafted jewelry laid out on display. Meanwhile, young men were playing soccer outside. As we were about to board our small boat for our return the the big expedition boat, Jefferson came from nowhere to wave goodbye. I was convinced that he will be running the entire country one day. After witnessing the villagers appreciation of what little they had, I felt a tinge of guilt for the wealth of the country I called home and the alarming rates of how we continue to selfishly consume the world’s resources. Now, I’d think twice before picking up that gallon-bottle of Acai from Costco. Acai is food for the birds. As our small boat zipped along the river, I looked down to feel the waters of the Amazon that give life to the village, the people, the land, and its nature. I thought back to Vics statement about the pink river dolphins, “Actually the Mississippi River used to have pink river dolphins too, but the pollution killed them off."